If you’re setting up your theatre or redesigning it, one of your key concerns is probably how you can best utilise the available space in your venue and create extra room for patrons. The more seats you can sell, the more profitable your theatre; however, you need to have enough space so that your patrons are comfortable. First-time venue designers soon realise it isn’t as simple as just cramming more people in. Good sight lines and traffic flow are essential elements for a successful, well laid-out theatre. Luckily, tiered seating and orchestra pits can help you in maximizing theatre space. If you want to create more space in your theatre, one of the first things to look at is tiered seating. In crowded cities, they build upwards, not outwards, and this uses exactly the same principle. If you have a black box theatre, it’s a great way to optimise your seating capacity, without overcrowding your audience. Good quality tiered risers will comply with all the building standards for grandstand seating. 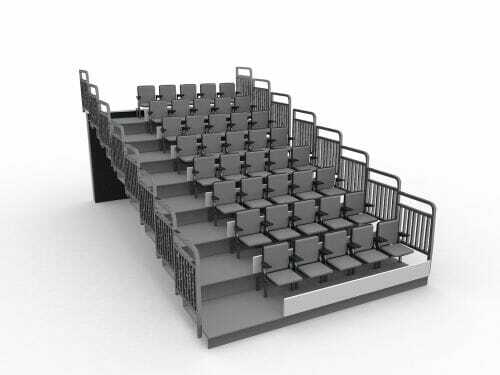 For example, our Upper Deck Audience Seating® Tiered Risers are solidly built and made to withstand a vertical load in excess of 100 psf (488 kg/m2). Tiered risers are a convenient seating solution, because they are easy to install and reconfigure, and are also extremely user-friendly. ‘Move and store’ carts assist with the installation, as well as the storage of the upper deck audience seating. They can be conveniently placed elsewhere until they are required again. Sounds easy? That’s because it is! Have you ever wished you could extend your stage and have more room for storage, but keep your fantastic acoustics? Well, now you can! Orchestra pit fillers are custom designed for the exact specifications of your venue’s orchestra pit and only take a small crew to install. They are strong, durable and have a unique column-beam design to maximise storage capacity below. The honeycomb deck construction has a dampening effect that lessens the “drumhead” effect on the stage. The end result is a perfectly integrated, quiet surface which conforms to all fire and safety regulations. Flexible solutions like tiered seating and orchestra pit fillers are invaluable when you’re planning on maximizing theatre space. We recommend you consult a professional for expert tips and advice, to ensure you get the right equipment for your venue.